A company in Waterloo in Canada has created technology that allows traffic congestion to be monitored via the cell phone signals coming from motor vehicles. Intelligent Mechatronic Systems has already sold the technology to the likes of the Canadian Blood Services and York Region, and has created pilot projects to enable other Ontario urban municipalities to test it as well. The software, known as Metro Traffic Engine, picks up signals from new and old cell phones, which are sent nearly every half a second to communications towers nearby. 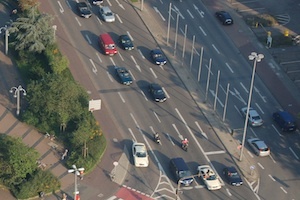 It then overlays them on a geographic map and is then able to separate out the signals which are coming from buildings, pedestrians and residential homes in order to provide a clear picture of vehicle traffic, according to Intelligent Mechatronic’s vice president of marketing, Blair Currie. The firm has entered into a partnership with Rogers Communications in order to tap into their cell phone network, although Currie says that the technology will work with any cell phone provider. At present, the technology does not work with smart-phones such as iPhone and Blackberry devices, but apps for those devices are underway. Canadian Blood Services use the technology in order to avoid traffic while making their daily deliveries to the hospitals in Ontario, while York Region purchased it so that they can monitor the level of traffic congestion on its roads and devise upgrades and expansions accordingly.